Since the Second Vatican Council, the idea has crept into our vocabulary that the altar is also a "table." There are a couple of things in this regard that are held to be in opposition. The "conservative" camp feels that the Mass is a sacrifice, a ritual to be carried out with precision and solemnity, and the "liberal" camp believes that the Mass is really more of a meal, a representation of the Last Supper - Jesus breaking bread with his friends. "Liberals" suggest that talk of the Mass as a sacrifice is "Old Testamentish" and needs to be eradicated because it is an avenue which allows pharisaical rubric-following to become part of the Mass. "At the Last Supper, on the night when He was betrayed, our Savior instituted the eucharistic sacrifice of His Body and Blood. He did this in order to perpetuate the sacrifice of the Cross throughout the centuries until He should come again, and so to entrust to His beloved spouse, the Church, a memorial of His death and resurrection: a sacrament of love, a sign of unity, a bond of charity, a paschal banquet in which Christ is eaten, the mind is filled with grace, and a pledge of future glory is given to us." People see the word "banquet" and often take that and run with it. So prevalent was the misunderstanding that the Mass is somehow a "meal of friends" in some places following the Council that a letter was issued several years ago from the Vatican, Redemptionis Sacramentum, which says the following in paragraph 77 - "The celebration of Holy Mass is not to be inserted in any way into the setting of a common meal, nor joined with this kind of banquet. Mass is not to be celebrated without grave necessity on a dinner table nor in a dining room or banquet hall, nor in a room where food is present, nor in a place where the participants during the celebration itself are seated at tables. If out of grave necessity Mass must be celebrated in the same place where eating will later take place, there is to be a clear interval of time between the conclusion of Mass and the beginning of the meal, and ordinary food is not to be set before the faithful during the celebration of Mass." While certain Vatican documents mention "the table of the Lord's Body", it still doesn't mean that the altar is itself a table - it is an altar. In the Spirit of the Liturgy by Pope Benedict (then Cardinal Ratzinger), he notes "The Eucharist that Christians celebrate really cannot adequately be described by the term “meal”.” Pope Benedict feels this "meal" mentality has crept in because of the fact that the priest now faces the people (a change that nothing from the Church has ever called for. Yes - I think the priest should celebrate Mass that way still, but that is for a later post). Saint Paul says to the Corinthians "When you meet in one place, then, it is not to eat the Lord's supper, for in eating, each one goes ahead with his own supper, and one goes hungry while another gets drunk. Do you not have houses in which you can eat and drink?" There are aspects of the Mass which are meal-like, but it certainly confuses people to refer to the Mass as a meal. May we always remember that the Mass is the "unbloody sacrifice of Calvary" and that the things that we see in the center of our churches are altars and not dining room tables. "Too often today people want Christ without His Church"
Amazing talk by Archbishop Timothy Dolan of New York! Worth the time to watch. Sorry for no posts in a while - last week was kind of crazy with a talk at Marian University for their pro life club and also we had our chapel blessed here at Ritter by the Archbishop (pictures to follow). This is a talk I gave last week at Marian on the encyclical Humanae Vitae "the most prophetic document ever." Talk on Humanae Vitae at Marian University from John Hollowell on Vimeo. Yesterday, the Holy Father beatified Cardinal John Henry Newman, a convert from Anglicanism. He is a popular figure in modern Catholicism, and many have fallen in love with Catholicism through the writings and the preaching of the now beatified Newman. One of Newman's great contributions (he had many) was a work entitled "The Idea of a University" in which he lauded the idea of a liberal arts education. He taught that true knowledge can never lead one away from God - only toward Him. Newman was a man who relentlessly sought the truth, and was never satisfied with partial truth. He felt that an education should ultimately be something that encourages a person to do the same thing. In "The Idea of a University" he notes "There can be no doubt that every art is improved by confining the professor of it to that single study. But, although the art itself is advanced by this concentration of mind in its service, the individual who is confined to it goes back." This is an outright attack on the way most higher education is carried out today. May our universities instill in our young adults a hunger to pursue the Truth wherever it leads them, may they be places that believe in Truth in the first place, and may we head the advice and teachings of this great man. Finally, a quote from Blessed Newman which was cited in the Holy Father's homily yesterday, which I think will become the quote for my classes here at school for the rest of the year. I used to be a big football fan of Notre Dame. I remember spending Saturday afternoons watching the Irish on NBC, wishing I could run on that field some day. I still remember vividly the first time visiting the campus with my friend Brian Boyle and his Dad for the Blue and Gold Game. The Grotto, the Basilica, it was all magical. Since going up to protest the honoring of President Obama, I've learned more and more about the problems at Notre Dame. Their most recent firing of an employee who voiced their opinion against the honoring of Obama has people talking again. My brother Tony sent me this blog post that has some awesome research on the history of Notre Dame spitting in the face of the Catholic Church. Click here if you never want to cheer for Notre Dame again. Grandparents Day homily from Ritter. I try to not read my homilies, and instead preach off of notes, but when I really want to make sure I get the wording right, I do preach off of a text. Some have asked for it so here it is in text version as well. If it helps, great, if you were one who threatened to use it for toilet paper - feel free to do that as well! We hear a lot in today’s readings about other faiths and peoples. The prophet Isaiah talks about how people will be sent to the corners of the world to spread the message of the Gospel. Jesus also talks about how the scribes and Pharisees will be locked out of heaven while representatives from all areas of the world will be entering the kingdom. This raises a very relevant question – “What does Christ and His Church teach about the issue of how we are to relate to and approach other faiths? First of all – the answer of the average person toady is summed up in one word – relativism. 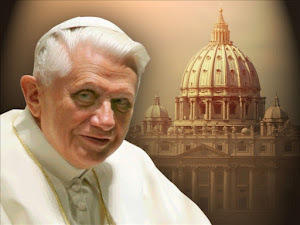 Pope Benedict’s first homily as Pope talked about what he called the dictatorship of relativism. He said it is our biggest problem as a world today. Relativism says that all religions are equal because they all point to some higher divinity. This means, then, that all the religions are just paths to a common destination. Relativism tells me that the only thing I should be worried about is trying to find the path that suits me best. This position of relativism is the ONLY position we are allowed to take as good peaceful likeable Americans. I remember being in college, which was a melting pot of faiths, and I remember being so proud of myself for reaching the conclusion of relativism. It seemed at the time like the enlightened and mature stance that separated me from being a fanatical close-minded Pharisee. That, though, is why Pope Benedict says it is a dictatorship – because for relativists there is no alternative but to be a relativist. So what’s wrong with relativism? When we look deeper, when we go beyond what’s nice or likeable, if we really think about it for very long we realize that not all religions can be equally as true. If two religions contradict each other or disagree with one another (And all of them do contradict each other on some major issues) then some have to be more right than others. As Levi Strauss once noted, if all religions are equally true then cannibalism is only a matter of taste, and isn’t actually WRONG. Relativism reduces religion to nothing more than a coping mechanism, religion is a panacea, it is a good chat with Dr. Phil, something that helps me cope with stress or any of my other problems. A relativist says that if Catholicism suits you, great. If not – no need to worry about leaving it behind. However, let us think about this for a minute together. I know a priest who works for the Vatican in Greece. His job is to have dialogue with the Greek Orthodox Church to continue looking for common ground and a reuniting of our two Churches. He said everyone there considers him to be a heretic, but he said it is oddly refreshing. He said it is actually more helpful because the Greek Orthodox recognize the serious differences between themselves and Rome, and they recognize that those differences MATTER! A relativist would never even start having a dialogue in the first place because there is not really any need for there to be a discussion if religion is just a coping mechanism for me. I teach at Ritter with a guy who sought me out to talk about things of the faith on several occasions. He isn’t Catholic, but he has told me on several occasions that he respects the Church for at least going out there and saying, “this is what we believe, we think it matters, and we think these beliefs have consequences.” He said he likes the fact that the Church says there are things that are right and wrong. He told me at the Ritter game last night that he wants to join the RCIA program. Two summers ago, the Vatican released a statement saying that we could no longer properly refer to other faiths as "Churches" i.e. the Anglican "Church" or the "Baptist Church." Many took this to be arrogant and were very upset, but many protestant theologians in our country thanked the Holy Father for clarifying why the Church believes what it believes. You can't have dialogue with someone unless you know where they stand. So what does the Church say about other religions? At the 2nd Vatican Council, the Church said that the Catholic Church contains the fullness of the truth. 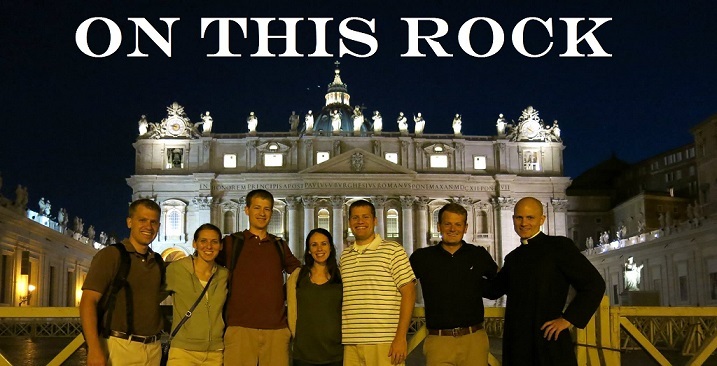 Other people outside the Church may still come to know God in two ways A) God reaches out to them or B) they may encounter Christ in some of the elements of the Catholic Faith that other religions share with us. Some big common elements that some faiths share with us would be Baptism or Scriptures. So what do we do? What does Christ and His Church call us to? Do we go and stand outside protestant churches or Buddhist temples with leaflets telling them we’re right and you’re wrong? We have the fullness of the truth and you don’t? Do we go looking for a fight, or at least someone to argue with so that we can have the satisfaction of being right? Of course not – and that’s what the Pharisee’s don’t get. The Pharisees were trying to use THEIR OWN power to make converts. We don’t win people by doing stuff like that – we win them over by being people of love who are never afraid to say what we believe, and why. We are called to be people who have found the priceless pearl of Christ, and if we understand the Church rightly, we want all people here with us, in the Church, because this is where others will find the fullness of the Truth. To tell someone lovingly and with compassion that they do not have the fullness of the truth, or EVEN TO IMPLY IT, is hard, just as disciplining a child is hard. It is easier to be a child’s friend and not have to say the hard things, which is why St. Paul is encouraging his people to do just that. In the end, we have to believe that what we are doing matters, that our Catholic Faith is more than just a coping mechanism that happens to suit me nicely, we have to believe that the Catholic Faith is not just one of many paths to God. Some religions are content with being labeled a path to God, but we are not. Catholicism is not just a path to a later goal, Catholicism and Christ are not separate – one is not a path to the other. Jesus says in today’s Gospel “go away I do not know you.” Some will say “my Lord, I thought you were a prize I receive later,” but in reality he is here now. The Scriptures are clear – Christ and His Church are inseparably welded together by the fire of the Holy Spirit – our Catholic Faith is no mere path because Christ is here now, and we consume him and he dwells in our midst, and that makes all the difference. "Civilization must be exposed for the filth it is... That, and all its disgusting religious-cultural roots and greed. Broadcast this message until the pollution in the planet is reversed and the human population goes down! This is your obligation. If you think it isn't, then get hell off the planet! Breathe Oil! It is the moral obligation of everyone living otherwise what good are they??" "All programs on Discovery Health-TLC must stop encouraging the birth of any more parasitic human infants and the false heroics behind those actions. In those programs' places, programs encouraging human sterilization and infertility must be pushed. All former pro-birth programs must now push in the direction of stopping human birth, not encouraging it." When I read his words, I instantly was reminded of Margaret Sanger, the insane founder of Planned Parenthood. The Discovery Channel Gunman will be treated like a leper and an outcast, and certainly he was struggling mentally, but I predict that the myth of over-population will not be addressed by the media at all, even though it has been shown to be completely crazy. Let us pray for a return to sanity with regards to the issue of life in our world, and let us have the courage to look at and talk about the "science" of over-population.